The Tamar Bridge is a suspension bridge in the south-west of England, carrying the A38 trunk road across the River Tamar spanning between the City of Plymouth on the east bank and the town of Saltash on the west bank. The Bridge is in public ownership, being owned and operated jointly by Cornwall Council and Plymouth City Councils. These Joint Authorities formed a special partnership in 1950 to lobby national government to fund a fixed crossing of the Tamar, but in the face of government inaction, decided in 1955 to go forward with the scheme themselves as a local enterprise financed from tolls. Parliamentary powers were needed for compulsory purchase of land, construction of towers in navigable waters, closure of existing roads and them to subsequently charge tolls.The Tamar Bridge Act gained Royal Assent on 27th July 1957 and provided these powers and the detailed design could then commence. The Act also created the Tamar Bridge and Torpoint Ferry Joint Committee, which was charged with the subsequent operation, maintenance and improvement of both the planned Tamar Bridge and the existing chain ferry operation at Torpoint. Mott Hay and Anderson designed what was to be the first significant post-war suspension bridge, and the longest ever in the UK. The bridge main span (between towers) is 335 metres, and with side spans and approach spans the whole structures is 642 metres long. 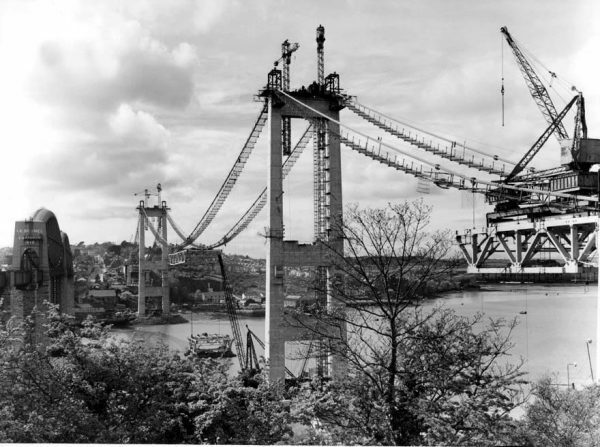 The original structure was essentially a traditional suspension bridge, symmetrical both longitudinally and laterally, save for the main deck movement joint being at the west (Saltash) tower. Cleveland Bridge and Engineering Company was awarded the construction contract on 19th June 1959, and the work was completed after two years and three months at a cost of £1.5 million, with up to 300 men working on the structure. The Bridge was opened to the public on 24th October 1961, and was formally opened by the Queen Mother on 26th April 1962 in a grand ceremony involving a fly-past and two naval frigates. Since that time the Joint Committee has continued to operate and maintain the Tamar Bridge, and between 1998 and 2001 the Bridge underwent a major rejuvenation when it was both strengthened and widened. The work was undertaken while the crossing was open to live traffic, ensuring adequate load carrying capacity for the future, and also adding an additional traffic lane and a dedicated pedestrian/cycle lane. More recently, during 2006, the tolling function has been upgraded with a major refurbishment of the toll plaza, including a new canopy, and the introduction of electronic toll collection, together costing approximately £4.5 million. The Bridge is now carrying over 16 million vehicles a year – over ten times that carried in the early years, and on a busy weekday over 50,000 vehicles use the crossing. The construction, operation, maintenance and improvement of the crossing have all been financed from toll income, and toll charges remain amongst the lowest for a major estuarial crossing in the UK.